Variety is the spice of life, but when it comes to your email marketing campaigns, it’s tough to find the right mix of spice and substance to satisfy your subscribers’ expectations and needs. 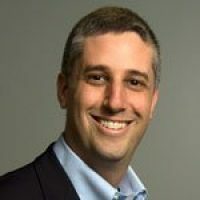 These days, personalization is KING, generating higher transaction rates, open rates, and click-through rates, which means that customizing the content for each and every recipient is absolutely critical to getting—and keeping—their attention. After all, with 215.3 billion emails sent and received this year alone, it’s incredibly tough to cut through the clutter and stand out. That’s where dynamic email comes in. Dynamic email delivers open-time personalization for every subscriber, with elements that update and refresh every time the email is opened. Using an automated marketing platform, marketers can send one-to-one marketing messages to hundreds and thousands of subscribers to drive a measurable uptick in engagement and ROI. Surveys can help you gather vital information about your potential and existing customers, such as their challenges, needs, and more. Instead of redirecting them to a web link, try embedding dynamic questions with radio buttons directly into your email so recipients can respond instantly, rather than having to click a link to a new page. 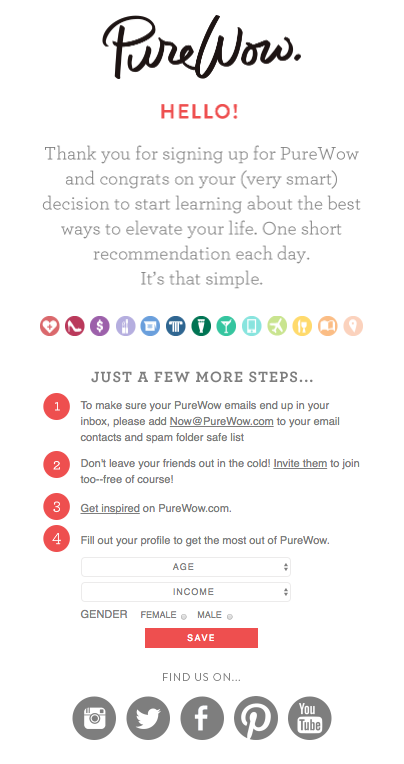 PureWow, a women’s lifestyle publisher, uses a dynamic survey to gather more information from their new subscribers once they’ve opted in. With dynamic surveys, you can also provide your recipients with instant gratification by enabling them to see the immediate results of their input within the email. This comes in handy if you’re polling your subscribers and want to show them how their answers compare to those from other respondents. It’s quick and easy—for both you as the marketer to set up and the recipient to click and respond. When it comes to promoting limited-time offers, registration deadlines, or upcoming events, most email marketers rely on an urgent subject line to entice their recipients. By adding a dynamic countdown timer prominently at the top of the email that displays the live time remaining (which changes each time the email is opened), you can ratchet up the sense of urgency. 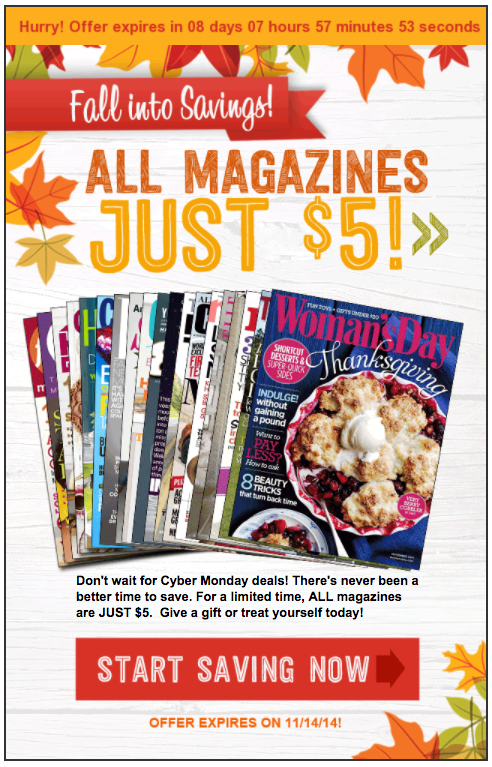 In the example below from Hearst, the countdown in the yellow bar at the top based on how much time is left before the magazine offer expires. Anything you can do to make things convenient for your subscribers is a huge win for your engagement rates. For example, you could add dynamic features that let recipients click to instantly add an event to their calendar or send a direct message to customer service (rather than routing them to your “Contact Us” page). Subscribers receive an abundance of email every day, and they’re becoming overwhelmed with boring email. Spice things up with special features like scrolling, zoom, fade, and image animations to wow them. With a dynamic email tool that integrates into your marketing automation platform, you can simply copy and paste a short HTML snippet into your template and then send it out to your subscribers. The impact more than justifies the minimal time and resources required to add the features. 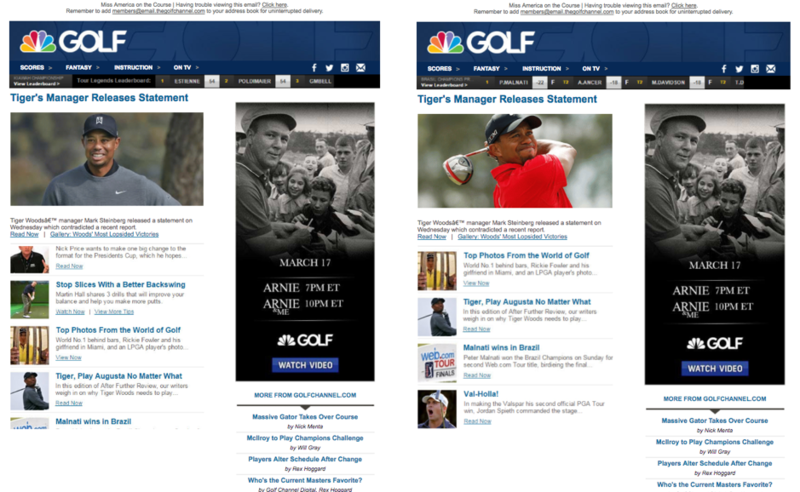 In the email newsletter below from the Golf Channel, dynamic features are added to the black leaderboard bar and set of articles. They automatically scroll to a new set of content as time passes. Another dynamic feature you can add to your emails is video content. You’ve probably already spent a lot of time creating videos for your website or social media channels. Why not leverage them in your emails as well? Embedding (muted) autoplay videos, like those on Facebook and Twitter, not only capture and hold attention, but research from Insivia indicates that viewers actually recall more of what they see in a video than what they read (95% vs. 10%). Captivating and memorable—what more could you ask for? Nowadays, your buyers expect you to know them. And with increasingly accurate recommendation engines from Amazon and Netflix, these expectations are only rising. What if you could deliver on this and give your buyers what they need, precisely when they need it? With dynamic emails, this is within your reach. For example, let’s say your company just launched a new mobile app. You could send an email that automatically recognizes each recipient’s device and uses dynamic content to route them to the appropriate app store to download your app. You could also use geo-targeting to connect them to a local sales rep or offer them travel and dining suggestions for a city they just booked a hotel in. B2B and consumer marketers alike are seeing the value of social media marketing, with 67.4% of internet users worldwide on a social network this year. If you’re marketing on social media, then it’s likely that you’re already working hard to deliver relevant content that engages and informs your audience. Embedding real-time social feeds—Twitter, Facebook, or even Pinterest and Instagram—in the middle or bottom of emails gives you a two-for-one engagement opportunity. With dynamic social feeds, subscribers can open and receive the email message, see your live feeds, and then easily click through to consume and interact with your social content, doubling your reach. For example, the Women’s Tennis Association (WTA) integrates their Twitter and Instagram feed into their email newsletters to promote subscribers engagement on other channels beyond email. With the ability to embed dynamic elements into every email to customize content—without having to rework the recipe every time—marketers now have an ultra-effective and efficient way to deliver highly relevant, one-to-one, personalized marketing at virtually any scale. Now THAT’S a tantalizing opportunity. Which of these dynamic features will you be exploring for your marketing? I’d love to hear in the comments below.